It seems at the big ol' comic-convention in New York City people will be able to pick-up an actual physical copy of a comic that features DC superheroes such as The Flash (and his villians!) interacting with not one, but two versions of Colonel Sanders of KFC fame. 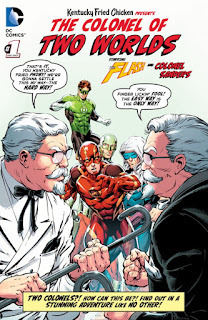 Apparently riffing on the concept of how we first saw the DC multiverse decades ago with, "The Flash of Two Worlds," we get to witness, "The Colonel of Two Worlds." You can also get it free online as of October 8th from Comixology. This is extremely bizarre. I mean, KFC did put out a Colonel Sanders comic back in July for SDCC, but that was just a cute little and weird marketing stunt. This is a big and weird marketing stunt that involves not just the fast-food chicken company, but one of the biggest comic publishers around. It feels more like a bizarre effort to grab headlines than it does seem like an actual desire to boost sales for either company. I mean, considering I just dedicated this whole post to the topic I guess it has succeeded. Still, a Universe such as ours in which this happens is a very weird one indeed.